Learn how to surf at the birth place of Surfing! We are conveniently located in the heart of Waikiki, right on the beach. We are only steps away from the ocean. Private group surf lessons require a minimum of 2 people to participate, and up to 5 students can be together in one group. You must be able to swim and over 12 years old to take this lesson. If you are 12 yrs and younger, you must take one-on-one private lessons instead of group lessons .If you want to maximize your time in the water, sign up for one-on-one private lessons. Make sure to ask about the photo services (with additional charge) to capture the moment! Choose your lesson time from 8:30AM, 10:00AM, 11:30AM, 1:30PM or 3:00PM. We operate daily all year round. We are located at the beautiful iconic Royal Hawaiian Hotel, AKA: Pink Palace. Our desk is located on the pool deck of the hotel property. You can find the desk by using the public beach access between Cheesecake Factory and Outrigger Waikiki Hotel on Kalakaua Ave. Most importantly, you must be able to swim to take the lessons! Make sure to check in at least 15 minutes prior to the lesson time. The lesson includes 10 minutes of land instruction. Bathroom is located at the Duke's Waikiki restaurant. Be sure to bring your own towel, sunscreen, and rash guard. 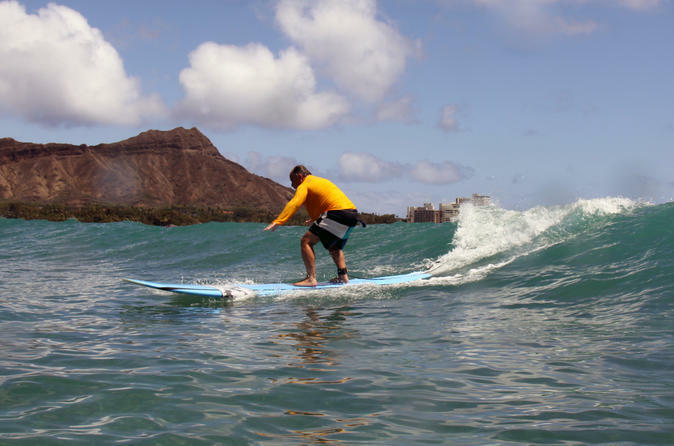 If you don't have a rash guard, you may purchase one at our retail store, Waikiki Beachboy, located on the hotel or you can borrow one of ours, based on the availability. Bring your own change of clothes. No shower rooms available. Bring cash or credit card for additional services such as photo and video services.